Many game designers need 3D pieces to use in their prototypes, and some game publishers may want to make games with 3D pieces yet are not prepared to create custom components. I don’t know whether EAI makes their own stuff, but one way or another, if the pieces can be bought by individuals at these prices, they must be available for much less at very large order prices. I get most pieces from EAIEducation.com. They are a school supplies seller. I’m looking at their latest “Spring 2014 Math” catalog (they also sell online, of course). I use quotation marks around the names EAI uses. I have listed their largest quantities, many are available at smaller quantities though higher cost per item. “Stacking counters”. p. 15. These are excellent, and I’ve already seen them being used in published games. 2,500 in a tub (10 colors, .75") $49.95. So 2 cents each. They also have “interlocking centimeter cubes”, same page, more expensive. You can also order single-color sets of blue, yellow, orange plastic cubes on p. 34, 1,000 for $19.79. 1 inch square “plastic color tiles” p. 21 (large enough to write numbers on) in four colors. 4mm thick, 2,000 in a tub $64.50. I use these a lot for prototypes instead of cardboard counters. They also list transparent, 48 for $3.95. I haven’t tried these. You can also get 4mm foam versions(“quietshape color tiles”), haven’t tried them. “Two-color counters” p. 77 (red on one side, yellow on the other), 3/4" 1,000 in a jar for $22.25. I use them for sites that must be explored, writing on the yellow side, sitting red side up. You can also get 1" magnetic ones, and transparent ones (single color, I think). “Double-sided black and red counters”, 1", p. 121, 200 for $5.95. “Black and red counters”, 3/4", not double-sided, two separate colors. 480 for $8.95. “Game pawns”. P. 15. 300 in a jar for $8.95 (colors may vary, 5 shown). These are classic fat-bottom skinny-top game pawns. So 3 cents each. “Blank playing cards”, decks of 54, $1.55 each of 36 decks for $39.95. P. 77 2.25" by 3.5"
Also transparent and colossal and normal cards available. Another way to provide 3D pieces is to use wooden blocks with stickers. You can buy blocks individually from Columbia Games. A more economical source is GMT, who often sell big bags of blocks very reasonably priced at conventions (such as PrezCon, WBC). The blocks above can be used the same way typical wargame blocks are used, though they’re twice as thick as wargame blocks. They have spinners, sand timers, plastic coins, dice (polyhedra), blank dice (http://www.eaieducation.com/search.aspx?Keyword=blank+dice&category=-1) and so forth as well. Rolco even sells blank game boards and boxes: http://www.rolcogames.com/category/board+game+accessories/12. You can also get bulk rocket ships, tanks, and lots of other small pieces. You get bulk pricing on orders of 5,000 or more. Those who have read this blog for a long time know that I am a categorizer. I try to organize things into categories in order to better to understand them and their relationships to each other. 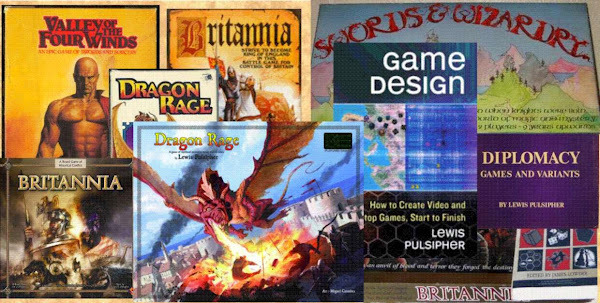 Recently it’s occurred to me that within the context of a game club meeting or even a smaller game session, different games have different uses, they fit into the session in different ways. This often is reflected in different price points, different lengths, different effort requirements, and so forth. I've just added this to my Learning Game Design course, and in my video blog experiment here is the link to the video. It applies mostly to tabletop games where there are more than two sides, each with a human (rather than computer) in charge. The Future of (Tabletop) Wargames? Getting out of the wargame ghetto . . . I was asked more than once during my PrezCon talk (by a publisher of hex-and-counter wargames, no less) where the future of wargames lies. The Charles S. Roberts/Avalon Hill originated hex-and-counter game style is a Baby Boomer hobby, and Baby Boomers are a shrinking group. Tabletop wargames now sell 1,000-2,000 copies, typically, whereas in Avalon Hill’s heyday they could sell over 100,000. Even in 2004-5 when I came back into the hobby it was easy to see that there was a wargames ghetto (as I call it). People in the ghetto were okay with that but it did not and does not appeal much to people outside. And it gets smaller over time. So what is the future of hobby wargaming? Practically speaking, the traditional market is disappearing. What can replace it? Tabletop wargames not only have to survive vis-à-vis other tabletop games but vis-à-vis video games. We always have to keep in mind the greater popularity of video games when we talk about any kind of tabletop game. Video games are easy to play, with the tremendous advantage that you don’t need to read the any rules, and video games are also becoming quite cheap with vast numbers of free to play and $.99 games available. Most video games that appear to be about war are actually closer to sporting events, as top RTS (Real-Time Strategy) game players must execute 200 actions-per-minute to succeed. But the capability to make two-player games primarily requiring thinking to succeed is there, and there are turn-based video games involving war (most notably, Civilization). Yet the future isn’t video games, at least not the kind of simulation-like video wargames that have been produced so far by companies like Matrix Games. These sell hardly better than tabletop wargames (3,000 is a number I’ve seen, minuscule for video games requiring that much effort to produce). I don’t think video games are a threat or a salvation for tabletop wargames. The future of all kinds of tabletop games is in multiplayer (more than two player) games, because a great attraction of tabletop games that video games cannot reproduce is the social interaction. Whether that interaction occurs within the game rules or not, it comes from people being in one place seeing, hearing, and sometimes smelling and emotionally (and sometimes physically) feeling other people. These games should not have player elimination, something that can unnecessarily bring out those feelings of failure. Practically speaking, too, a game without player elimination is likely to be shorter than one with elimination. Video games achieve this through single player games/campaigns that are often puzzles that you will sooner or later solve if you’re persistent. With save games and respawning there is no way to Lose. SPI’s surveys indicated that 50% of play of their games was solo. People who are inclined to solo play often like two-player, detailed wargames. I think the solo player is much more likely to play video games these days. Solo play is a mostly-dead-end for tabletop games. So games that allow for the social aspects of face to face gaming, and don’t put the loser on the spot, are where wargaming has a chance to succeed. I think we’ll see more grand strategic wargames rather than tactical games. First, grand strategic games are more believable for more than two players than tactical games. You can easily think of entire nations as competing in a multi-sided way, whereas battles with more than two sides are almost unheard of. Second, tactical games in the wargame tradition are littered with nuts and bolts and details that hold much less interest for people in our fast living, imprecise century than they did in the glory days of Avalon Hill and SPI. There are lots of tactical games involving fighting, but they are individual skirmish games like Heroscape and many RPGs, not “nuts and bolts” games. Another aspect of grand strategic games is that ultimate success usually depends on building up your economy, as it does in almost any war. Games that build up have proved to be more attractive to many people than games that tear down. A grand strategic wargame can be one that combines the tearing down that’s involved in taking economic value from another player along with the building up that people seem to like, a combination of negative and positive. In contrast, a battle game, one without an economy, where the objective is terrain-based or simply killing lots of the enemy, is purely negative. Games with multiple numbers on each piece don’t have much appeal. Players don’t mind having lots of information on cards, but not on pieces. (NO lookup tables, either.) 3D makes it harder to put numbers on pieces, as well. Stacks of counters are also a bad idea, though less so if only the owning player is allowed to look in the stack. A good decision I made decades ago in Dragon Rage (which is a hex-and-counter wargame) was to prohibit stacking. With the larger pieces in the 2011 edition, I’ve avoided the old problems of stacks of half inch counters. Perhaps a reason for the popularity of “block games” beyond the fog of war is that they avoid counter stacks, and often have less information on them than do traditional counters. This trend is already enormously clear in video games. Players want to be rewarded for participation, they don’t want to have to earn their rewards by making good decisions. Hobby wargaming often involves studying the games. People don’t study games much anymore, especially casual gamers. Between cheap or free video games and the proliferation of many hundreds of new tabletop games each year, people are accustomed to playing a game only a few times before they move on to the next one in a kind of “Cult of the New”. I know people who have played Britannia more than 500 times, but nowadays you’re going to find few newly published games that anyone will ever play 500 times, especially not one as long as Britannia. I think wargames are still going to be a haven for people who want old-fashioned gameplay depth as opposed to simple variety, but if you want to reach a larger market you need to recognize that the number of significant decisions has to be reduced. I’m put in mind of a young lady who used to attend our university game club. At age 18 she was exceptionally intelligent and focused, and when she played games she really put her brain to work (more than most), but because she was playing games to relax she did not want to play anything like a standard wargame where you have bunches of pieces to move in each of your turns. That was far too many decisions to make. She liked tactical video games, where you have just a few characters to control. That’s the kind of person who can be attracted to strategic multiplayer games that involve war, but only if they are designed to be broadly appealing. Be sure your wargame doesn’t have a player moving dozens of units every turn! Gamers are also much more interested in personal stories and avatars in games than they were 40 years ago. RPGs are an example, and many kinds of video games, both just coming into existence back then. Wargames by their nature tend to be about nations and large units, though there are many games with individuals as the primary units (squad level games). The word “story” is in “history”, but the history of warfare tends to be impersonal. The kinds of personal stories people like aren’t about the Military, by and large. I’m not sure how this is going to pan out, as the grand strategic games I recommend are not well-suited for the “you are there” mentality (think History of the World or Diplomacy). What wargames need to focus on is the other people playing the game, rather than on the details of the game system. Britannia has some detail in it but it’s essentially a simple game to play, and the really good players are playing the other players, not the game system. You have to master the game system but that’s not the ultimate mastery, as opposed to chess and so many two-player wargames where mastery of the system is all that matters. (Oddly enough, mastery of real generalship is much about psychology, but wargames rarely reflect real warfare.) That’s the kind of game we need, though Britannia is not the best example because it’s much too long for most players. One of the new versions of Britannia I’ve created can be played in 90-120 minutes and has been played in 84, even though the players were not hurrying. Yet it is still clearly Britannia. Games where “Yomi” is needed, discerning the intentions of other players, reading their minds, are popular for many reasons (think poker, Werewolf, Resistance). Wargames need to make Yomi more prominent, and the details of mechanical play less prominent. Multiplayer, of course, immediately puts Yomi to the forefront in highly interactive games. On the other hand, you can’t remove a fairly high degree of interaction from a wargame and still have a wargame, instead you have something that begins to approach a puzzle or multiplayer solitaire. I don’t see this as a route wargames can take because then you have a major disadvantage of a wargame - the tearing down - without the compensating advantages of high interactivity. Where there’s a place for two player wargames is on tablets and PCs, so that those who like this kind of ultimately confrontational math-like game can find opponents, and can play in short sessions even if the game itself is quite long in aggregate. For examples, see http://www.shenandoah-studio.com. Finally, all games are noticeably getting simpler and shorter (especially video games). Wargames must as well. That’s quite a challenge for multiplayer games simply because the more players you have, usually the longer the game. I have pursued a quest for a “one hour (multiplayer) wargame” for many years, and while I usually end up with 2+ hours I do have one game that has been played in an hour by three players. But that will remain exceptional, except in wargames that use cards rather than a board. Card-based wargames are another possible route out of the “ghetto”, but when you use cards you usually (though not always) abandon maneuver, which is one of the salient aspects of war. I’ve briefly alluded to where “simulations” are going. The kind of simulation that values the model before the game, that tries to force a particular outcome to match history, is rapidly going down the tubes. The kind of model that Phil Sabin calls a simulation - though I wouldn’t - that helps one understand history will still be around. If you’ve read Sabin’s book Lost Battles you’ll know that his simulation to help understand what really happened to during ancient battles is pretty simple, not at all the kind of highly detailed simulation we used to get from SPI. On the other hand, wargames can never approach the abstraction of the typical Eurostyle game. Wargames have to be models of some reality, and anything that happens in the wargame ought to correspond to something that happens in reality. That’s rarely the case in Eurostyle games, which are frequently abstractions with some kind of atmosphere tacked on (yes there are exceptions). Eurostyle games are designed to have particular paths or actions that can be easily blocked by the opposition (without any actual destruction), and that’s not even close to the nature of warfare. Will the “grognards” of the ghetto like these wargames? Maybe not, but it doesn’t matter, because they’re gradually going out of the market for games and publishers have to look at younger markets. Having said all this, I’ve described one of the kinds of games I like to design, so maybe I’m prejudiced. Or maybe I saw the need years ago and have been working on it ever since. When I started this I intended to write something fairly brief, but many of the trends in games in general have come into the question of the future of wargames. I’ll stop here before it grows any further! I will be a speaker at the East Coast Game Conference, April 23-24 in Raleigh, NC. Exact time or day as yet unknown. The topic will be “On the Horns of a Dilemma” (Game Design). I now host (through Fedora) my online audiovisual courses at https://courses.pulsiphergames.com . They are still on Udemy.com at higher prices. They include “Learning Game Design”, “Brief Introduction to Game Design”, and “Get a Job in the Video Game Industry”. I will very soon be opening a course “How to Design Levels/Adventures for Video and Tabletop Games”. Some time after that I’ll open “How to Write Clear Rules (and Game Design Documents)”. PrezCon is a relatively small friendly board and card game convention in Charlottesville Virginia at a Doubletree Hotel. There are no RPGs, no miniatures to speak of, no CCGs, no video games. Most of the players are gray-haired Baby Boomers, although there is a smattering of younger players as well. It uses the same format as the World Boardgaming Championships, you pay a single fee and play it in as many tournaments as you can squeeze in. There are not quite as many tournaments as at WBC, and they are generally smaller because the attendance is about 3/8 of WBC attendance (for example 15 in the Britannia tournament in a good year compared to 40 at WBC). But there’s lots of competition. There’s also an auction, an auction store (where I bought a 2008 copy of Risk for four dollars for the peculiar arrow pieces), and a large open gaming area. Where WBC offers half a dozen or more talks, there is only one at PrezCon (that I give, and that gets about half a dozen in attendance). There are game vendors as well, some of them publishers such as Worthington Publications, GMT, and Mayfair Games. Two of those three are wargame publishers and that’s reflected in the tournaments and open play, with many more wargames and you would see at GenCon. The vendors are set up from Friday through Sunday though they are packing up by midday Sunday. Justin Thompson and company have PrezCon running like a well oiled machine in its 20th year. When Justin was temporarily laid low by illness his partner Grant Dalgliesh took care of things. Owing to work reasons my friend and I arrived Thursday night instead of Wednesday night this year, and I miss the extra day to talk with people. (I don’t play games at conventions and never have: I can play games at home. And as some of you know I’m not that big into playing games other than D&D, which we definitely don’t see at PrezCon.) We usually stay until Sunday mid-afternoon because he usually plays in the Roborally finals (which he won for the fourth time). Just as at WBC and Origins, by that time almost everyone has left and it’s quite dead. I think GenCon stays alive somewhat longer though I have had to leave before noon because of a very long trip home. It’s a great contrast to the UK Game Expo a few years ago, where I had a talk scheduled at 1 PM on Sunday and the audience filled the large room, as well as for the talk after that. I suppose because Great Britain is relatively small and train travel is common, people don’t feel the need to leave as early as they do at American game conventions. At one point I recruited a friend who had played the game the year before to playtest one of my prototypes with a publisher. He asked me privately whether he should go easy on the other player. I wouldn’t tell anyone to do that as it is slightly disrespectful to the other player, and in any case the publisher needed to see what the game could really do, so I told him know do the best you can. And he won the game fairly easily, showing that there’s something worth learning in the game (as opposed to some transparent games where experience doesn’t seem to make much difference). As I have observed at other conventions, especially those that are strictly board and card games, there are striking cultural differences if you take the time to notice. Non-white gamers are very rare at PrezCon, just as they are at WBC. They are much more noticeable at conventions that include RPGs, CCGs, art and written fiction, and so forth. One friend saw a lot more “friction” in the game playing this year, though I noticed a lot less than last year. Friction as in rule arguments and even one occasion of possible cheating. Yet when a friend of mine played his first game of Britannia in the tournament he found that the players gave him genuinely good advice rather than trying to con him with poor advice, and he won the game. The wargamers are not quite like Eurostyle players who often seem to be collectively solving a puzzle and discussing what the best move would be, but they do want new players to enjoy the games. I have a friend who doesn’t go to PrezCon because he doesn’t want to tangle with the “sharks”, the really good players, nonetheless I think it’s a pretty friendly and mostly laid-back group considering the level of competition. My talk this year was about strategic wargame design. There were lots of comments and questions that my recorder couldn’t pick up so I need to edit it before I post it on my website for anyone who wants to listen. The PowerPoint slides that I made for it are already posted at http://pulsiphergames.com/teaching1.htm. Don’t leave out that 1.